That's a perfect plant combo! I'm so thrilled that you're so happy with both of them. In about 3 years, one pkant has coverd a space about 2 1/2 X 3 1/2 feet. I can give you more if you want coverage faster. They will green up some over the course of the season, perhaps depending on how much sun they get where they're planted. Mine get morning sun in the summer. But they always reliably turn dark again in the winter, which seems appropriate given how dark our winters are. Oh, that Geranium start has pumped out lots of lovely new leaves. I'm so proud that the baby you adopted from me is your favorite this week, can you tell? If they go where I think they're going to go they'll get a lot of sun, afternoon sun even. I hope they're up for it! Thanks again Alison, I'm glad to that I got them late in the season so they went into the stock tanks - that's given me a chance to really watch them over the last few months. Pretty, dark, and evergreen to boot. That's one that I'll be looking for! I know I'm reviving an old blog but I'm after some Black Scallop and cannot find it anywhere. Does anyone have some they can post? Yes your full sun and my full sun are definitely different creatures. As for your pink fav I have a soft spot for camellias. Ajuga (at least 3 different types) is growing in my lawn a bit, but most of it is in my neighbor's lawn. When in bloom it's a thing of beauty, and the bees love it. So when you mow your lawn are the plants growing close enough to the ground you can mow over without chopping them? Oh man...I should have mentioned the one I got from you at the swap too! It's been very interesting watching how the color differs, you said yours was also 'black scallop' right? They've been right next to each other since September and maintained their color differences. I do love the hint of green on yours too. 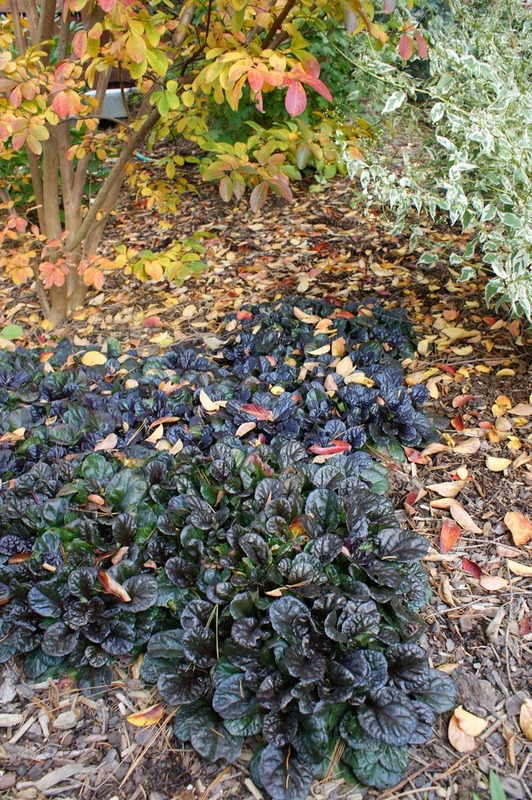 This is such a fabulous looking ground cover plant Loree, and I haven't picked on it before until you highlighted it but it does look like a miniature chard! Glad to know it's not just in my head! I love that geranium. I like the ajuga, too, but only for places where it's ok for it to spread. Right plant, right place...right? I've just seen situations where it pops up everywhere from little pieces, sometimes creating serendipitous combinations, sometimes becoming a nuisance. I really like Ajuga pyramidalis 'Metallica Crispa'. Very purple and metallic and textural, and doesn't seem to spread as fast as other Ajuga reptans. Of course if you're looking for a good spreader then that would be a negative trait. Does that geranium reseed much? I guess I should pop over to Alison's blog and ask her! I haven't seen that amazing Ajuga before. They are useful plants, I like Catlin's Giant, it has lovely blue flowers as well as good foliage. I shall look out for this one. Every garden needs a few "useful plants!" I love the black scallop to, even recommended it for Regional Plant Picks as a tough ground cover for Fine Gardening Mag. I've paired it with our native Sedum 'Cape Blanco' and have it growing below Saxifraga 'Lodon's Pride that grows on a wall above it. Another silver and black pairing I did last year has the silver foliage potentilla, this ajuga and mondo grass. Waiting for it to fill in. I'm with you about the flowers, A good mowing helps take care of that if its wandering the garden by itself. Wow you've me lots of ideas for what to plant with it, thanks Debbie! I have grown this variety, and it did great the first year. I've also grown Chocolate Chip and Catlins giant, it seems they struggle with a crown rot fungus however. Looking at the first few photos made me want to put it in a salad (in a good way). It loses the chard look when it's allowed to spread I think, and is really attractive - bonus that it's super tough! Good point, once there is a mass of them you don't tend to focus as much on the individual leaf shapes. So love ajuga, both black and green, great weed supresser. Boy once it gets going it will spread. I love the shiny leaves best. I really appreciate everyone's comments about it being a spreader...I will be careful!